The promise of conservation for one National Register of Historic Places member is threatened by unfinished maintenance work. The prized Henn Mansion needed saving quickly if it’s pledge was to be kept. The elegant Henn Mansion is located in Fairfield, IA on what used to be the campus of Parsons College. In the early 1970’s the property was bought, becoming the new home of Marharishi University. Upon its purchase, the University had to agree to maintain Henn Mansion in its original state. In 1983, Henn Mansion was added to the National Historic Register and in 1984 extensive restorations on the mansion took place to prevent the structure from facing total collapse. Today, the building is used as the University’s Human Resources office. Along with restoration, air conditioning units were added to the structure. A large hole on the east side of the building was dug for installation of these units. That hole was unfortunately left open, eventually impacting the stability of the foundation in the southeast corner of the building, and causing ladder cracks to form in the brick. The University’s maintenance management company needed a repair solution that kept the promise of preserving Henn Mansion intact, while also causing little disruption to the building’s day to day office activity. 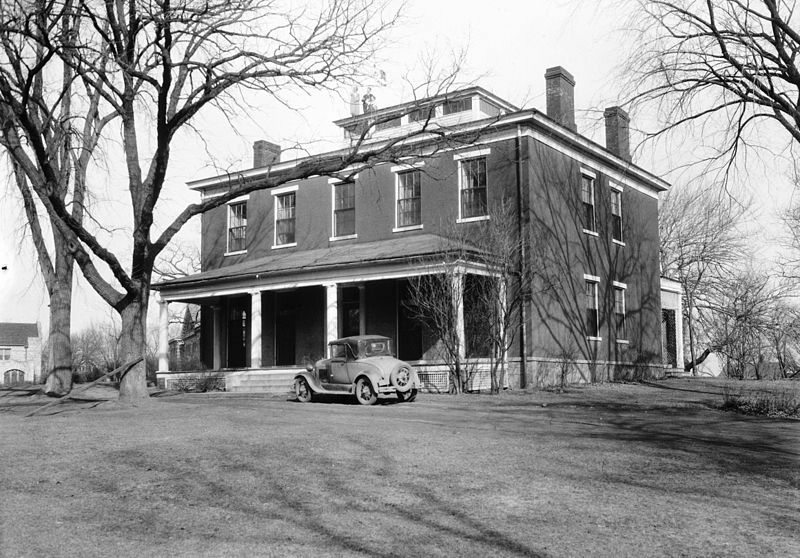 The footing of Henn Mansion was designed as a “continuous” footing. Similar to the “Century Old Barn” project, the limestone rock used as the footing are in continuous contact with the soils below. The settlement of the foundation was caused by loss of support of the soils under the continuous footing. Since the Mansion was constructed of limestone rock, it couldn’t be repaired with traditional piering methods since there is no place to attach the anchor brackets. 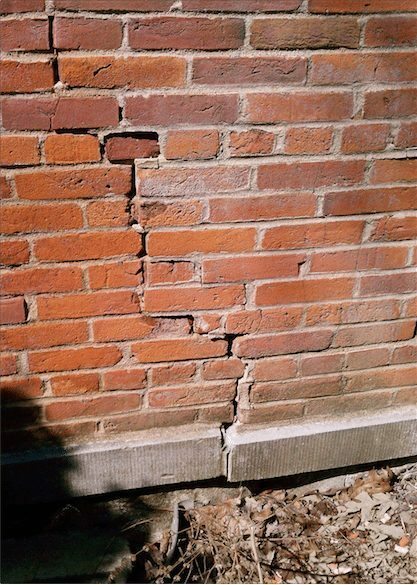 The University contacted URETEK ICR to asses Henn Mansion’s foundation issues. After careful evaluation, the URETEK Deep Injection Process™ (UDI) was selected to stabilize the foundation, as it is ideally suited to void fill, seal, lift, or stabilize the soils below various foundation types. UDI precisely places expanding structural polymer in a uniform, sequential, top down pattern of injection that eliminates the differential degrees of non-uniform density within the soil matrix. As the structural polymer expands it creates an area of densification, which compacts and densifies the adjacent soils to increase/restore the load bearing capacity of the soils. URETEK successfully restored the soil’s ability to support the structure’s continuous footing. During the repair, lasers sensitive to 1mm of movement were attached to the Mansion. When that movement was registered by the lasers, injection ceased as the soil was now sufficiently densified to support the load of the structure’s southeast corner as well as prevent the exterior ladder cracks from streaching further. Where other foundation contractors are more limited in the types of foundations they can repair, URETEK ICR’s processes suit a much larger variety. 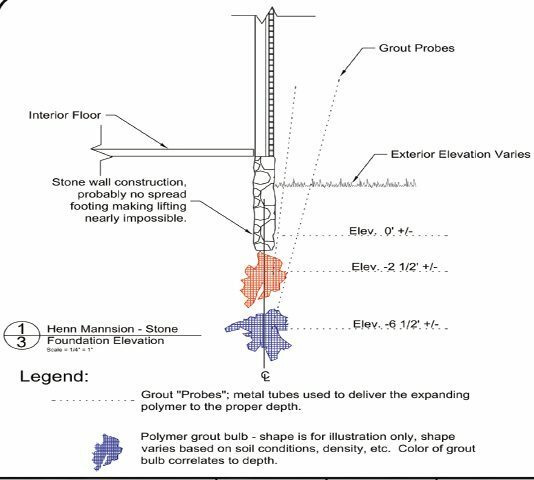 The historical stone foundation of the Henn Mansion was properly stabilized by URETEK’s patented geo-polymers and executed by their professional crew members. URETEK ICR’s repair process was quick, clean, caused little to no disruption, and most importantly… helped save the historical building in it’s original state.